Samsung just sent me their BD-D5300 Blu-Ray Player for review. Which more or less means they sent me their new Smart Hub software for review, since I am not a Blu-Ray expert. But I have been spending lots of quality time with various forms of connected TV over the past six months, so I dare say I’ve got some experience in that field. What’s cool about the BD-D5300 is that it offers much of the Smart Hub functionality found in Samsung’s top-shelf TVs, but at a fraction of the cost. So while you’ll have to watch it on your years-old 720p Sharp (like me, see above photo), you’ll get access to Sammy’s new Smart Hub software, featuring premium content from Hulu Plus, Netflix and Vudu, and a host of free and paid apps including Facebook, Pandora and Twitter. The player doesn’t have integrated Wi-Fi, but an optional “Link Stick” dongle supports wireless networking including AllShare (DLNA). Listing at $149 but available on Amazon for $103 (as of mid-June 2011), the BD-D5300 offers a lot of bang for the buck, at least on paper. My initial experience setting the unit up was pretty good, but also held up by a few bugs. Most notably, while I had no problems connecting the player to my home router via Ethernet, nor setting up a Samsung account and installing a few Samsung Apps, I ran into bugs using Twitter and Vudu. In both cases I got a connection error referring to “Network or Service interruption,” yet other apps would load content just fine and all of my Network Settings verifications checked out. Hmm. I’ll have to ping Samsung about this one. Also, the included remote has a standard numeric keypad, which is fine for TV and Blu-Ray/DVD needs, but a bit lacking when it comes to entering text (network setup, searching, posting to Facebook/Twitter, etc). Most menus I’ve encountered use a T9-style system for quick text input from the keypad, but password fields use a clunkier system requiring a lot of extra button clicks and screen refreshes to input capital letters, numbers and symbols. Hopefully I’ll get more used to the T9 system – and not have to input any more passwords anytime soon, either. I’m just recently through season one of Modern Family and season two is available on Hulu Plus but not Netflix. I can’t think of any better way to test out the Smart TV capabilities of the BD-D5300 than by signing up for a one week free trial, grabbing that remote, and kicking back to some streaming TV. Assuming I can get that network bug ironed out, that is. 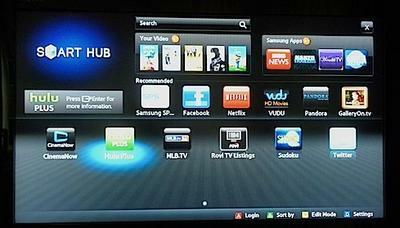 Any of you have a Samsung TV or Blu-Ray player with Smart Hub? You like it? Have any tips or tricks or favorite apps to share? Comments away!